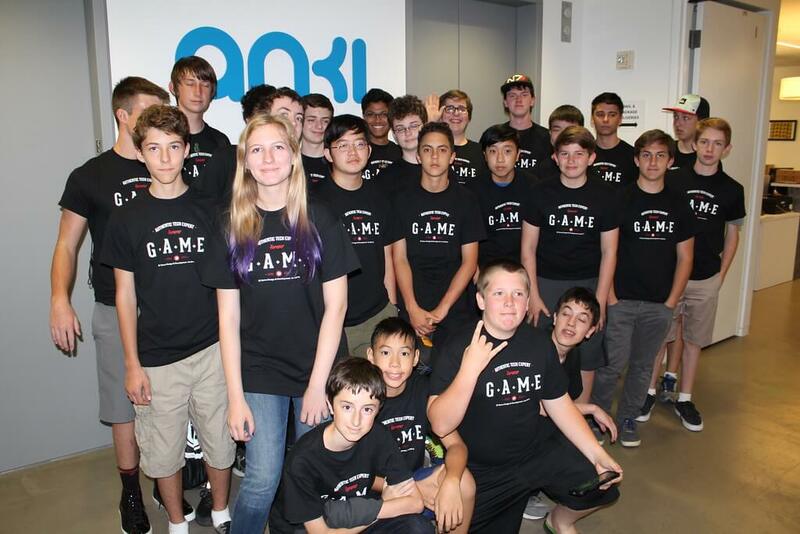 Gaming Industry Insights: Academy Students Go Behind the Scenes at Anki! We're back with another studio tour recap! If you're a teen who has considered attending iD Game Design & Development Academy, chances are you've heard about our studio tours. These off-campus events bring aspiring game designers and developers face to face with STEM professionals, providing valuable gaming industry insights. 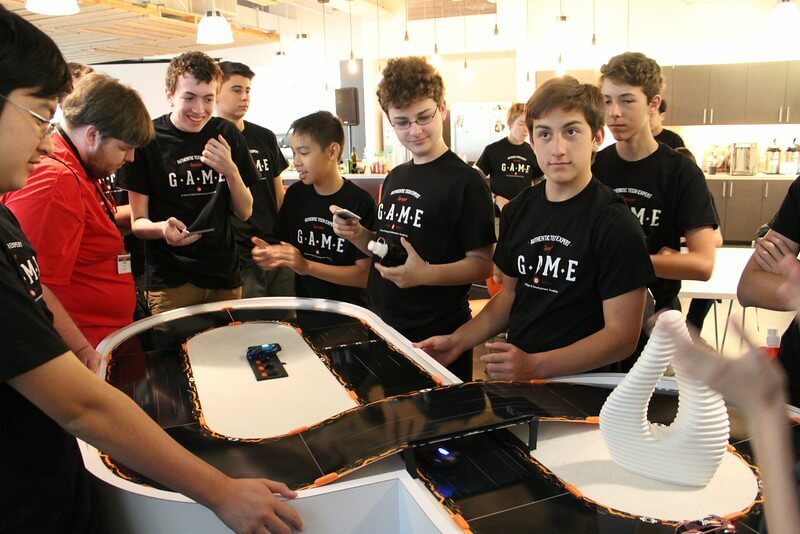 This summer, students attending iD Game Design & Development Academy held at Stanford have had the opportunity to tour Anki, maker of Anki DRIVE, a "first-of-its-kind racing game that lets players use a mobile app to race real battle-equipped toy cars - alone or against friends." The cars are powered by robotics and, according to the company's website, suitable for ages 8 and up. Click here for more information about Anki DRIVE. 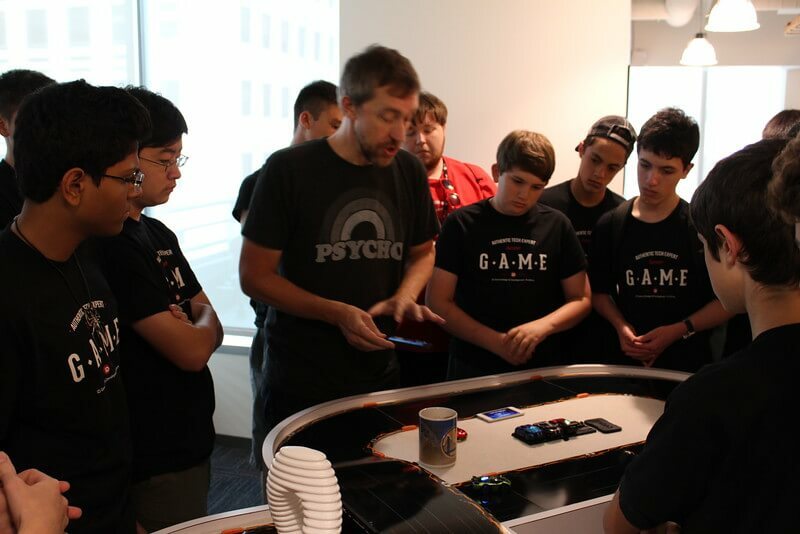 During the tours, iD Game Design & Development students get to experience the company's newest product called Anki OVERDRIVE, and learn about the variety of employees it takes to create a high-performing artificial intelligence toy. Students enjoy live, hands-on demos of the products and take part in personal Q&A sessions with the developers. Anki OVERDRIVE will be officially released on September 20, 2015. The game can be found at anki.com, as well as Amazon, Target, Toys 'R' Us, and Apple. Once the tour destination is announced, the excitement is palpable--the opportunity to visit the Anki studio in person is a rare treat. The night before the most recent tour, students participated in an Anki DRIVE tournament to get more exposure to the game and get amped up for the next day's excursion. On the morning of the tour, they researched the company and prepared questions for the developer Q&A in order to get the most out of their visit. The Anki office is situated in downtown San Francisco near other big-name tech companies such as Mozilla. Anthony, the Anki employee who lead the most recent tour, was extremely knowledgeable and was able to answer any questions our students tossed at him. In the past we have also had Shelly, the office manager, lead the tours. The staff has been consistently enthusiastic and welcoming, putting students immediately at ease in the new environment. The vibe of the Anki studio is described by employees as "curious, collaborative, and authentic." Anthony explains, "we have a mix of impassioned people all from various backgrounds, working together towards a common goal. What more could you ask for? We have some of the best talent in the world. But we check our egos at the door." iD Game Design & Development Academy students begin the Anki OVERDRIVE demo. In the eyes of our students, getting to play the all new, yet-to-be-released Anki OVERDRIVE has been a definite tour highlight. According to our academy Assistant Director, Jon, "many of our students ask if we are going to be getting the new product in the labs now or next year. They're excited and really want to see more of it." Our Anki guide, Anthony, added, "The most illustrative moment I can think of was when the cars would line up at the starting line all on their own, a feature that shows off our localization tech. Every time this happened, without fail, a collective gasp was let out in the room. iD Tech students asked great questions and made very insightful observations throughout the demo." In addition to the Anki OVERDRIVE demo, our students have enjoyed gaining gaming industry insights from the Anki product creators, and experiencing what the day to day work environment is like in a major game studio at a robotics company. For many students, it's a lot easier to imagine a future in game design or game development when you've walked the halls of a real studio and conversed with talented professionals who share the same passion. It's easy to imagine a future in the gaming industry when you've walked the halls of a studio and conversed with the pros. iD Game Design & Development Academy students test out Anki OVERDRIVE on the office track. Obviously, it's not every day teens come face to face with some of the gaming industry's greatest minds. As academy Assistant Director Jon explains, "the tour is a great way for students to see what it's like to be in a production studio...the team members at Anki were great at fielding questions and keeping the students interested." The impact of interacting with a panel of esteemed developers is sure to be lasting, and we can't wait to see what the future holds for our next generation of game designers and developers. Thanks, Anki! Looking for another academy studio tour recap? Click here and learn about our students' visit to SolTech in Atlanta, GA.